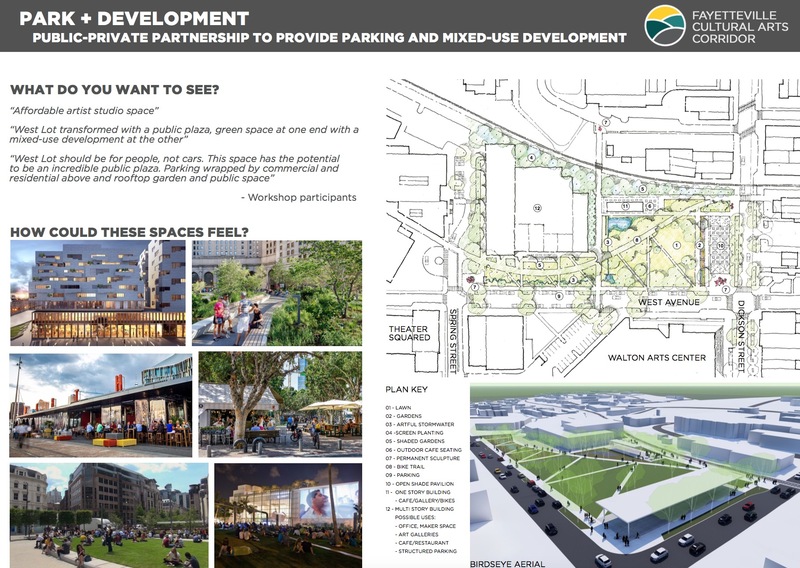 Early concepts for the West Avenue parking lot include a range of ideas, including water features, open lawns, shaded gardens, cafes, pavilions and a multi-story, mixed-used building with a parking deck. 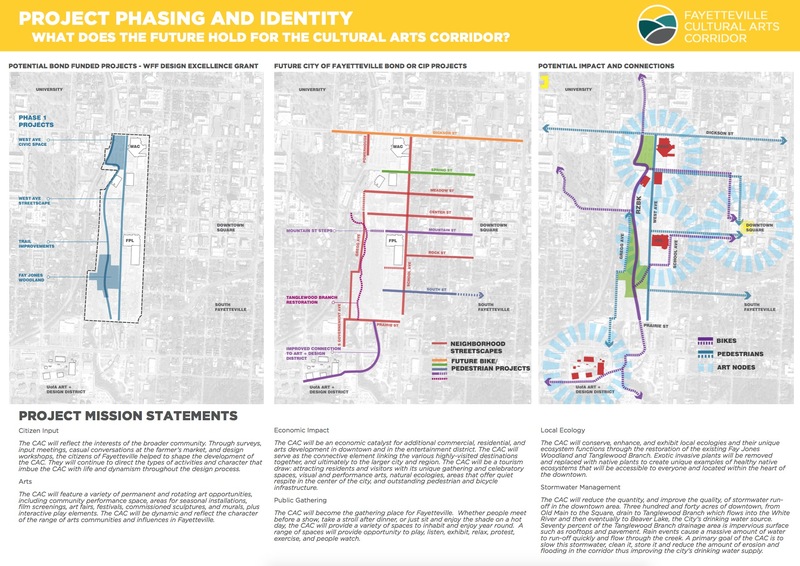 Residents now have a more visual idea of what the upcoming Cultural Arts Corridor might look like in downtown Fayetteville. 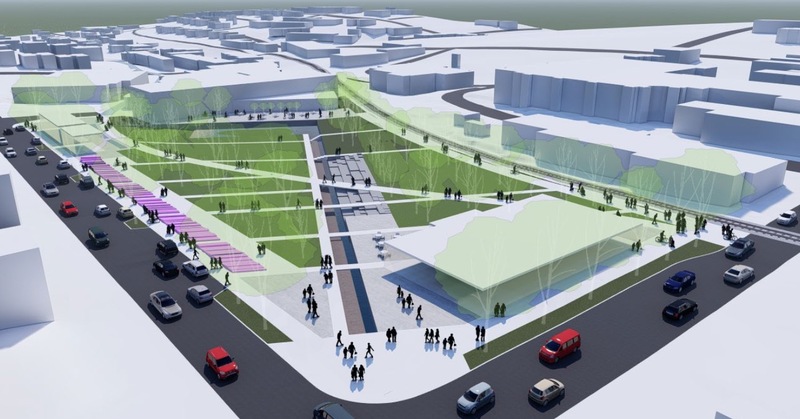 Landscape architects from Nelson Byrd Woltz this week unveiled early concepts for the corridor, including five sketches of a reimagined West Avenue parking lot across from the Walton Arts Center. 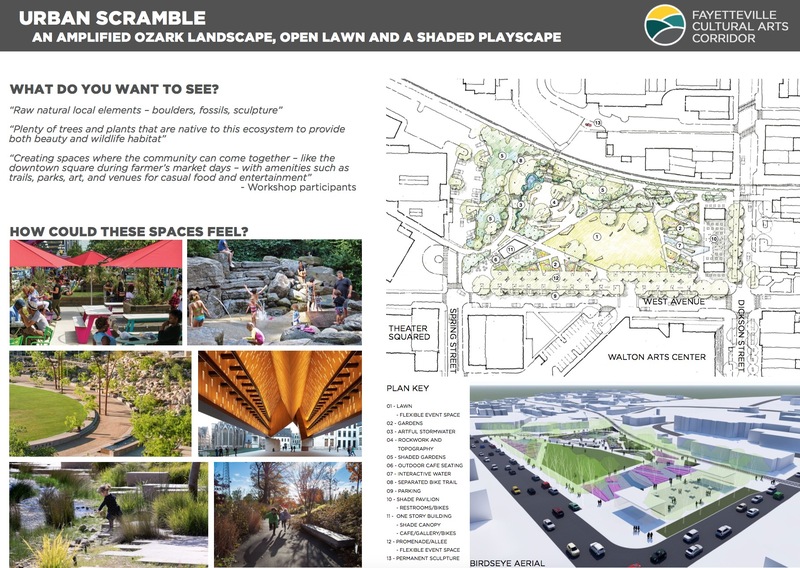 The concepts were presented to City Council members on Tuesday, and at a series of public input sessions held in Fayetteville this week. 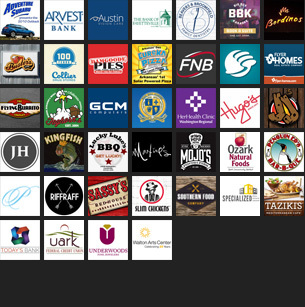 Breck Gastinger, lead project manager, said his team was asked to be aspirational in their design work, and as such, the project is seen as a framework for celebrating the artistic production and creativity that is unique to Fayetteville. The concepts were created based on feedback gathered through surveys and public input sessions over the summer. The sketches included amenities such as gardens, green space, trails, water features, shade pavilions, permanent sculptures and restrooms. Gastinger said each option addresses water runoff since over 70 percent of the downtown surface area is impervious. 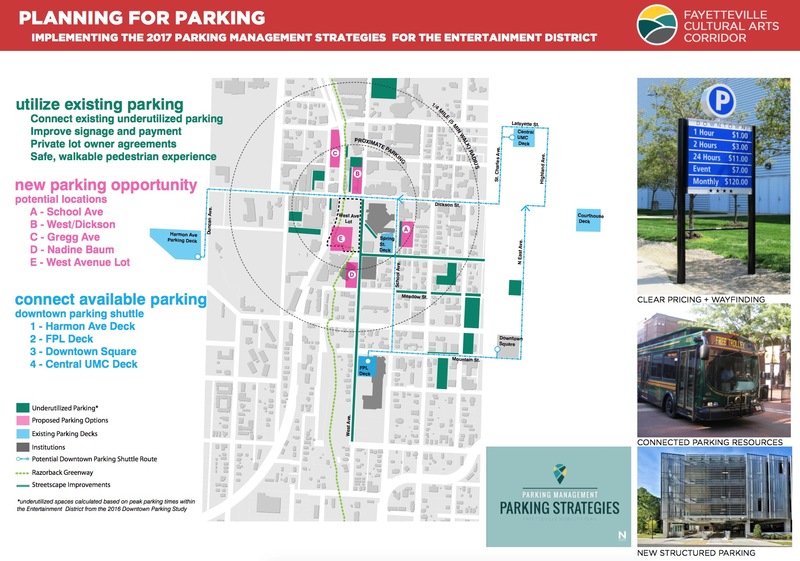 Parking options are also included in both the schemes and in maps of potential areas for added spaces in an effort to offset the loss of parking that would occur once the lot is developed. The 298-space, city-owned lot is one of the largest undeveloped properties in the downtown area, and has been the subject of much discussion over the last decade. The lot was a candidate location for municipal parking deck that was eventually built on Spring Street behind the Walton Arts Center. It has also been coveted by developers, including several that offered to purchase the property from the city for various residential and commercial projects through the years. The city has briefly entertained multiple offers, including as recently as 2016 when Mel Collier, whose family’s drug store has operated on Dickson Street since 1950, offered to buy the entire 2.8-acre lot for $3 million. Collier’s offer came in response to a Fayetteville City Council discussion on whether to sell a 0.39-acre portion of the parking lot to developer Brian Reindl, who had hoped to construct a five-story residential and commercial building at the south end of the lot. The discussion was tabled indefinitely in August of that year. 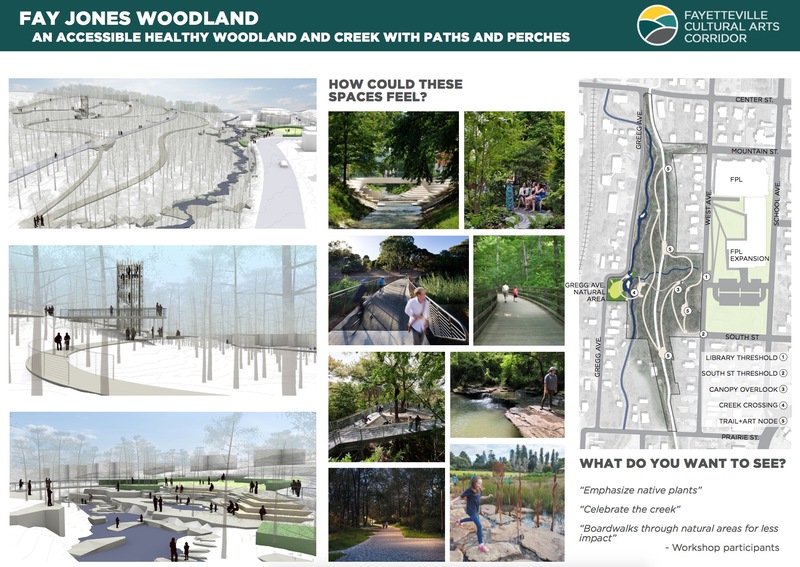 In addition to the concepts for the West Avenue lot, the architects also presented ideas for a “Fay Jones Woodland” park to be built alongside the Fayetteville Public Library, along with strategies to improve the stormwater and ecosystem health of the Tanglewood Branch watershed, and improve the streetscapes and parking in the downtown area. 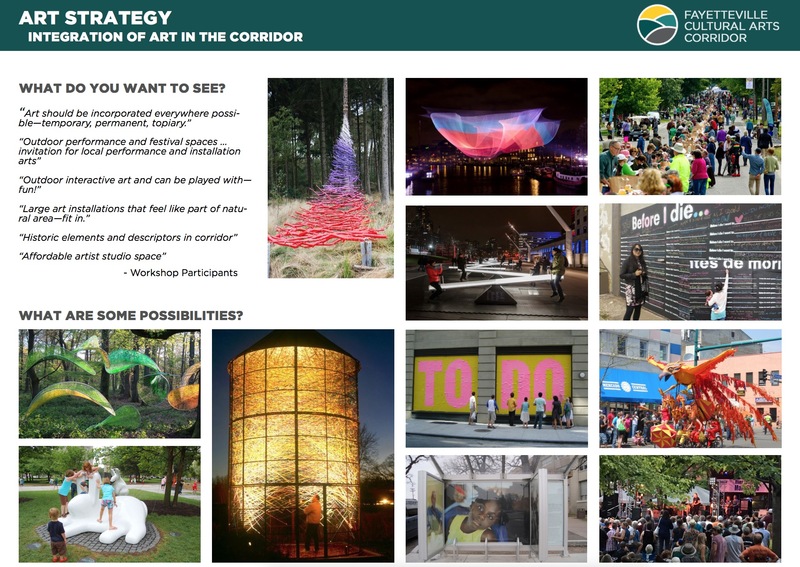 Ideas for types of public art that could be included in the corridor were also presented in the plan. The two-phase design is funded entirely by a $1.8 million Design Excellence Award grant from the Walton Family Foundation. Phase 1 will cost $618,431 for schematic design, and Phase 2 is estimated at $881,569 for design development, construction drawings, and bidding services. Final designs are scheduled to be unveiled by the end of the year. As for funding of the actual construction of the project, city officials said they expect to present a bond referendum to voters early next year. Bidding and selection of a construction firm would likely come in late 2019, with the construction process wrapping in 2021. 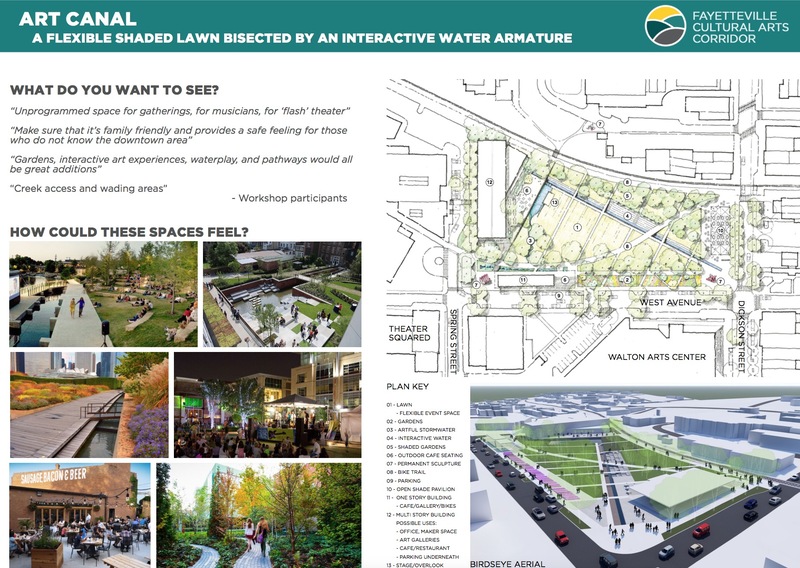 An open shade pavilion to the north and a water canal with interactive features and a flexible lawn space leading to a multi-story building for possible offices, art galleries or cafes and an underground parking deck. 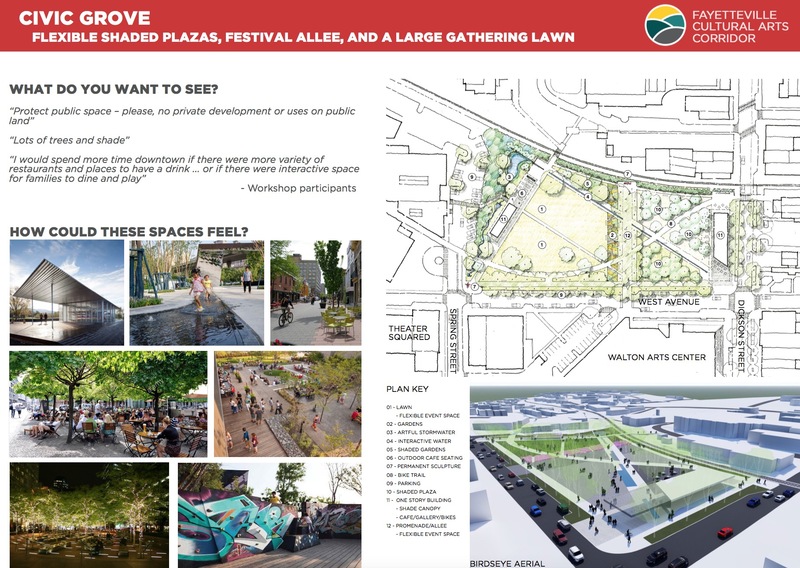 A shaded northern plaza with walkways to gardens and a lawn with a flexible event area bordered on the south by water features, public art and space for cafes or retail space. A centralized lawn space surrounded by a shaded playscape with room for cafes, shops, gardens, interactive water features and a pavilion. 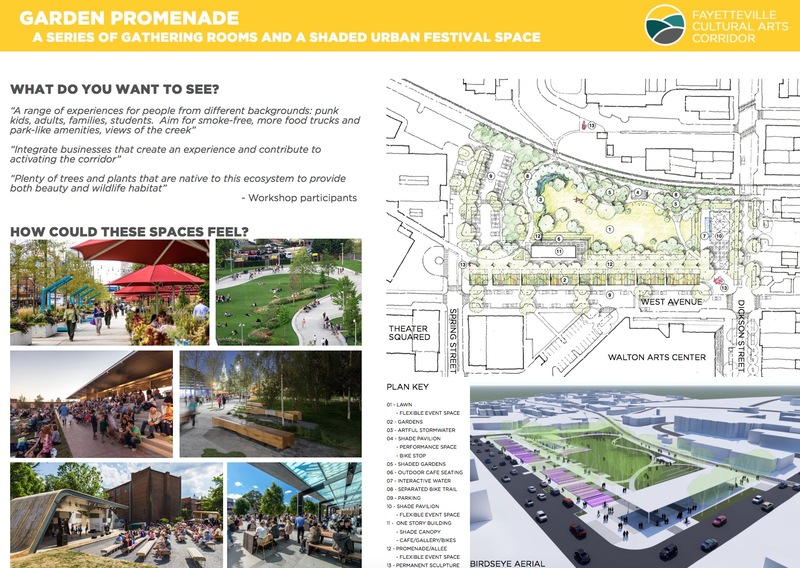 A garden-lined promenade and a flexible event lawn with a pavilion to the north, parking to the south, and room for cafes, retail and shaded gardens. A southern multi-story building for possible offices, art galleries or cafes with structured parking, and a mix of lawn space, open shade pavilions, gardens and public art. A woodland and creek park area alongside the Fayetteville Public Library. 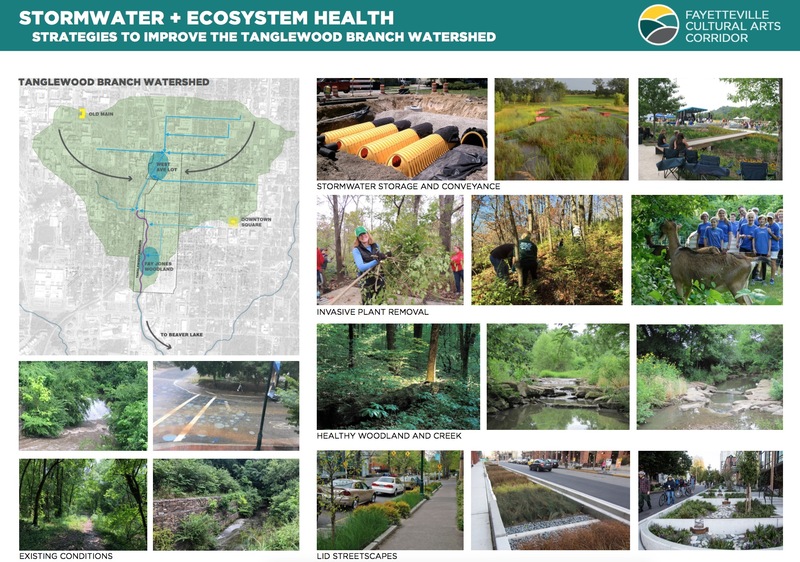 Strategies to improve the local watershed. 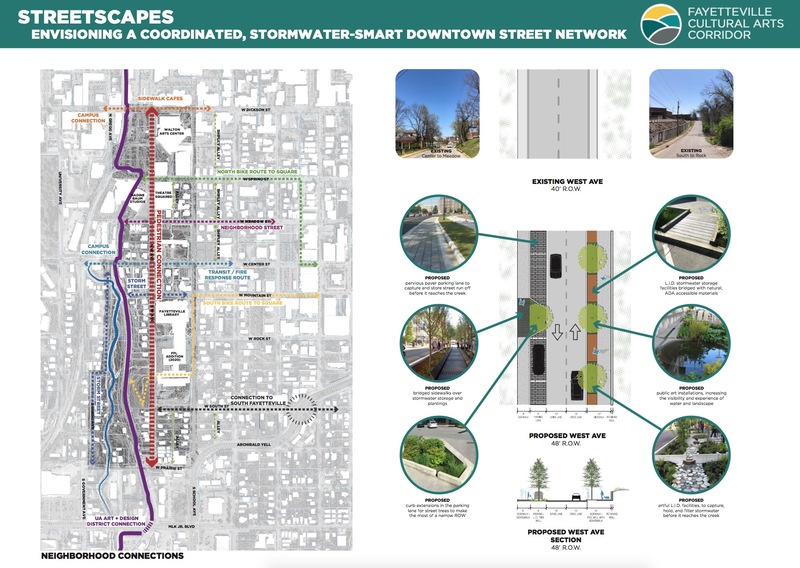 A vision for how to handle stormwater runoff in the downtown area. Ways to offset the loss of parking from development of the West Avenue parking lot. Integration of public art features into the corridor.